Public reason may be possibly the most boring topic in contemporary political philosophy, which takes some doing, but it is also the name of a new blog by a bunch of political philosophers which looks as if it might become quite good. They’ve got a distinguished line up of contributors, not all of whom have yet contributed, and I suppose those of us with a sense of history will worry that this looks a little bit too much like the old Left2Right blog, which looked so promising at first, but never seemed to me to do that much beyond hosting some great posts by Elizabeth Anderson on Hayek and other related topics, and rather ran into the buffers. Anyway, I’m particularly pleased to see my old-friend-whom-I-haven’t-seen-in-years Alyssa Bernstein on the roster, as she’s great fun, if not a little Rawlsian. Thinking of Rawlsians, this thread over at Brian Leiter’s place could become great fun, and possibly quite heated. In my balanced splitting-the-difference kind of way, I’m comfortable with the thought that Rawls was both a political philosopher of the first rank and that much Rawlsian thought is very possibly deep down “a generalizing [of] one’s own local prejudices and [a] repackaging [of] them as demands of reason”. And I think I’m comfortable with that thought because it seems obvious to me that much top-notch political philosophy has always been that, but the good stuff has never been just that, and one of the reasons progress gets made in philosophy, if it does, is through thinking about the extent to which this might in fact be the case and what, if anything, we might do about it. What’s funny is that philosophers sometimes get quite so defensive about the idea that their work might just be a little bit more parochial and a little less universal than they like to think it is, and that historians too often use their discipline’s own distinctive and not always attractive prejudices as a way of avoiding thinking hard about the difficult, interesting stuff. Thanks also to this thread from Harry B at Crooked Timber, who asked the important question, “are philosophers scruffy?”, thereby reminding me of one of my favourite bits of De Civitate Dei, at the start of Book XIX, in which Augustine discusses Varro’s demonstration that there are 288 logically possible sects of philosophers, 144 of which are scruffy (“following the habits and fashions of the Cynics”), which I suppose follows naturally from our discussion of bearded philosophers from a few days ago. I gave 50p to a chap in the street earlier this afternoon, who followed me into the Co-op in order to spend it, and, once there, asked me whether I was a relative of Hurricane Higgins, who is, or was, I think, a snooker player. I’ve never contemplated any possible physical resemblance between the two of us, and I’m not sure anyone else has, either. But “who else does Chris look like?” threatens to become a new year meme. 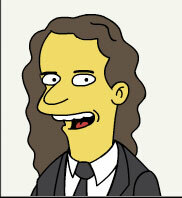 A friend sent me this image, just the other day, claiming to detect a “somewhat striking” resemblance. 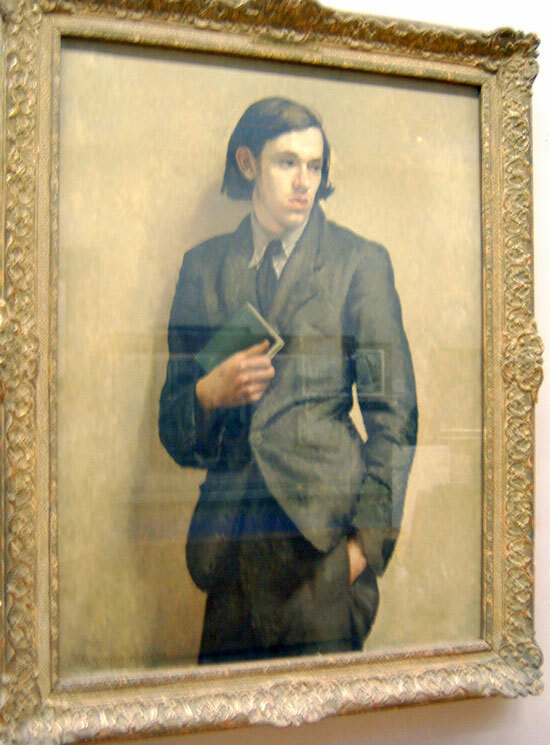 It’s Thomas Burke’s painting, “The Student”, and it hangs in the Walker Art Gallery in Liverpool. A couple of recent likenesses are below the fold, for people who want to engage in scientific comparisons. Author christopherbrookePosted on January 7, 2007 Categories blog sillinessLeave a comment on Lookalikes? You are Mr. Darcy from Pride and Prejudice. You’re pretty arrogant, but that pride stems from the deep-seated knowledge that you are generally the most superior creature in any given room. The good news is that you are deeply loyal to your family, and you have a generous and charitable streak, even though most people don’t notice because you are too busy practicing a large vocabulary of stern looks. This might seem like a surprising result, but it’s actually quite scientific, in that Josephine did the quiz imagining herself to be me and got the same result, too. Author christopherbrookePosted on October 9, 2006 March 3, 2019 Categories blog silliness, books7 Comments on Which Jane Austen Character Are You? I’m not sure this is an entirely scientific game, which is why I’ve felt free to express no preference, or, on occasion, a fourth option. 1. Beatles, Stones or Beach Boys? Beatles, though less than I used to. 5. Bach, Beethoven, Mozart? Beethoven, I think, though The Magic Flute is something special. 6. Australia, Canada, New Zealand? New Zealand (filial piety). 7. Groucho, Chico, Harpo? Harpo. 8. Morning, afternoon, evening? Evening. 9. Bridge, Canasta, Poker? Bridge. 10. Fargo, The Big Lebowski, O Brother, Where Art Thou? OBWAT. Didn’t think a great deal of Fargo, and haven’t seen TBL. 11. Hobbes, Locke, Rousseau? Rousseau, though Hobbes is, of course, fabulous. 12. Cricket, football, rugby? Cricket. Test Match Cricket. 13. Jane Austen, Charlotte Bronte, Emily Bronte? Whichever one of the B’s wrote Wuthering Heights. 14. Parker, Gillespie, Monk? No preference. 15. Arsenal, Chelsea, Tottenham? Arsenal, I think, because Thierry Henry is so much fun to watch when he’s on form. 17. Henry Fonda, Cary Grant, Jimmy Stewart? Jimmy Stewart. 18. France, Germany, Italy? Italy. 19. Apple, orange, banana? Banana. 20. Statham, Tyson, Trueman? Too young, I’m afraid. Larwood. 21. Rio Bravo, El Dorado, Rio Lobo? Are these films? 22. Katharine Hepburn, Meryl Streep, Ingrid Bergman? No preference. 23. Chinese, Indian, Thai? Indian. 24. Handel, Scarlatti, Vivaldi? Handel. 25. Oasis, Radiohead, Blur? No preference. 26. Fawlty Towers, The Young Ones, Yes Minister? Yes, Minister. 27. Chekhov, Ibsen, Shaw? Ibsen. 28. American football, baseball, basketball? Baseball. 29. FDR, JFK, Bill Clinton? FDR. 30. Lenin, Luxemburg, Trotsky? Luxemburg. 31. Paris, Rome, New York? Rome. 32. Fitzgerald, Hemingway, Steinbeck? Raymond Chandler. 33. Blue, green, red? Red. 34. Guys and Dolls, My Fair Lady, West Side Story? Oklahoma! 35. J.S. Mill, John Rawls, Robert Nozick? John Rawls. 36. Armstrong, Ellington, Goodman? Goodman. 37. Ireland, Scotland, Wales (at rugby)? Wales. 38. The Sopranos, 24, Six Feet Under? No knowledge. 39. Friday, Saturday, Sunday? Saturday. 40. Hamlet, Macbeth, King Lear? Macbeth. 41. Fried, boiled, scrambled (eggs)? Fried. 43. England, Australia, West Indies (at cricket)? Not Australia. Otherwise, it depends. I’ve certainly cheered for the West Indies against England in my time. 46. Trains, planes, automobiles? Trains. 47. North By Northwest, Psycho, Vertigo? Vertigo. 48. Third, Fourth, Fifth (Beethoven Piano Concerto)? Third (Eroica Symphony). 49. Coffee, tea, chocolate? Coffee. 50. Cardiff, Edinburgh, Dublin? Dublin. Which Monty Python Sketch Character Are You? Author christopherbrookePosted on November 8, 2005 Categories blog sillinessLeave a comment on Which Monty Python Sketch Character Are You? UPDATE [3.20pm]: regardless of how many people have heard of them, do we have any reliable stats about the relative numbers of bloggers and doggers in the UK? Or about the percentages of doggers who blog and bloggers who dog? Enquiring minds want to know. Who do you think the world’s “top thinker” is? Is it Robert Cooper? Christopher Hitchens? Yusuf al-Qaradawi? Naomi Klein? Tom Friedman? Anthony Giddens? Bernard Lewis, perhaps? Apologies for forgetting to Talk Like A Pirate yesterday, on international Talk Like A Pirate day. I won’t do that again. Author christopherbrookePosted on September 20, 2005 Categories blog sillinessLeave a comment on Gar!